Old cameras often lurk forgotten in drawers and closets only to be discovered on the sad occasion of sorting through a loved one’s possessions after he or she passes. Such was the case with this No. 3A Autographic Kodak, which had belonged to a friend of Down the Road reader Jan. I was saddened by the circumstances when Jan contacted me with her offer to place this camera on permanent loan in the Jim Grey Camera Collection. But of course, I was delighted to receive it. The No. 3A Autographic Kodak is a giant among folding cameras at 4¾ inches wide by 9½ inches tall – 1¾ inches wider and 3¾ inches taller than my more typically sized folding Kodak Six-20. That’s because the No. 3A takes size 122 film, which produces big postcard-sized 3¼-by-5½-inch prints. Postcard collectors know well the “real photo postcards” produced when photographs were printed onto paper marked with a place for a stamp, address, and message. Kodak introduced size 122 film in 1903 just for this purpose. Real photo postcards were popular for several decades, finally falling out of favor by the 1960s. Kodak soldiered on with the format but finally gave up, producing its last roll of 122 in 1971. The real photo postcard was at its peak in 1914, however, when Kodak introduced the No. 3A for a 20-year manufacturing run. 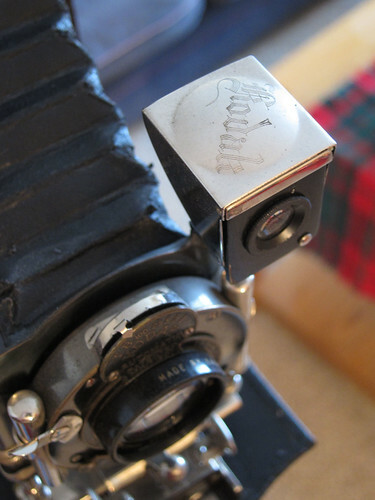 As an autographic Kodak, it included a flip-up door on the back and a little stylus. When special autographic film was loaded into the camera, lifting the door let you write a few words on the film’s backing paper. Then you’d leave the door open for a few seconds in the light, which caused the words you wrote to transfer photographically to the negative. 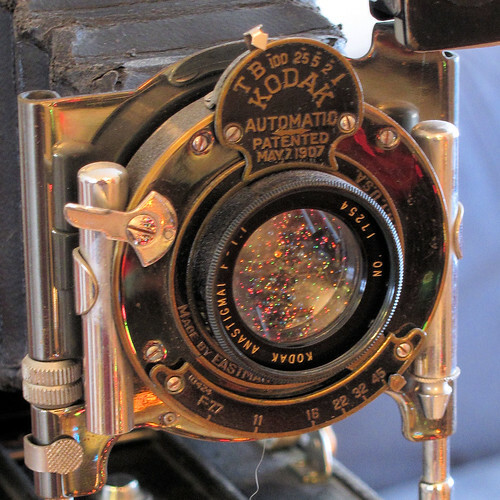 Kodak suggested that this be used to record the photograph’s subject, the date, and even the camera’s settings as a reminder when the photographs were returned from being developed and printed. Typical of autographic Kodaks, my No. 3A’s stylus was lost long ago. Kodak offered its No. 3A with a few different combinations of lens and shutter. This one comes with the premium f/7.7 Anastigmat lens, which could be stopped down to an itty-bitty f/45. 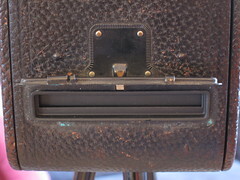 Its Kodak Automatic shutter can expose the film at 1/100, 1/25, 1/5, 1/2, and 1 second, as well as time and bulb. Focusing the lens involves moving the entire lens assembly along its rails. You first lift, slide, and set the black “catch” on the focus scale to the desired distance. Then you squeeze the two chromed levers toward each other and slide the lens assembly up to the “catch,” where it stops. To frame a photograph, you lift up the chromed cover on the viewfinder and peer down through it, aligning the camera until you’re satisfied. The No. 3A’s lens assembly can move horizontally and vertically to fine-tune the framing. Making it move is a little complicated, so I’ll skip telling you how. Given the No. 3A’s defunct film format, I’m unable to try out this camera. It’s just as well, as the bellows is full of holes! So I bought another Kodak Metal Tripod No. 1, screwed this camera onto it, and placed it on display in a corner of my home office. I’ll get to enjoy it every day this way! Do you like old cameras? Then check out my entire collection. My dad was a manager in Kodak for about 500 years. I never paid for a camera of film growing up let alone processing. Happy days. There were many old cameras kicking around the headquarters. They have a certain smell as do the developing fluids. I only wish now that I had paid ore attention when I was a kid. And I certainly will take a walk down memory lane when I get the chance to have a gander at your other cameras. Cheers and thanks for the memories. Wow, how cool is that, that your dad worked for Kodak! Hard to believe that they are likely to file bankruptcy now. I hope you enjoy looking at my other camera posts. It’s very sad they might not survive. It’s for one reason only and that is they completely failed to embrace digital technology until it was too late. Also there was the instamatic/polaroid debacle. Things change and maybe that’s just the way things have to be. I will shed a little tear for Kodak. I always wanted to go to Rochester with dad but never got the chance. It’s very hard for a big company who is still making huge money on a product to see that the market is changing and that their cash cow won’t last. There are so many psychological forces at work that tend to keep companies from seeing the truth. I’ve been to Rochester on business. It’s very cold there all winter! I have 2 of these exact cameras with cases with out stands. Does anyone know what they are worth? OMG, what a cool camera! No wonder no one smiled in pictures back then. It took forever to set the damn thing up! It would be really cool to find one of those “postcard” pictures from it. Nice of your friend to loan it to you so you can enjoy it. I was thinking the same thing, display it…it’s too pretty to be in closet! Great conversation piece! Thanks for sharing that! It was fascinating! The real reason nobody smiled is because, without flash, the lens had to stay open for a long time to register enough light. So the subjects had to sit/stand stock still. It was hard to hold a smile for that long! Very cool camera, Jim, and a great post. As a big fan of “real photo postcards,” I especially enjoyed learning how the words were transferred photographically to the negative. The words appeared in the negative between frames. I know that words are frequently scratched somehow on to the face of real-photo postcards, but I don’t know for sure how it’s done! Aha. I completely misunderstood how the stylus thing worked (see my reply to Mike’s comment below). Classic camera. At f/45 you could probably have the full length of Washington Street in focus if you could just get everybody to stand still for an hour. Hahahaha! Or explode an atomic bomb nearby for use as a flash. I have the manual that came with my No. 3A — I’ll have to see if it has that line in it! It is pretty rare to see one of those in which the leather and the metalwork is so beautifully preserved. 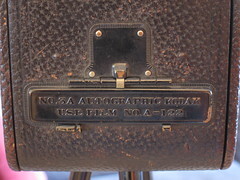 Kodak made a big deal of the Autographic feature for adding notes to the negatives, featuring it in all its advertising, and putting it on hundreds of thousands of nearly every model of its cameras. The feature and the hype may have sold some cameras, but I haven’t seen any evidence that more than a tiny portion of users ever actually made use of the Autographic capability. I have never seen a print with an Autographic note. I’ve always assumed that at least some of the notes seen on real photo cards and other prints were applied in the camera with the stylus. On the other hand, I know that some notes were applied to negatives in the lab. Is there a way to distinguish “in camera” notes from “in lab” notes? I don’t know. I do know that you can scratch words into a print (an old-style print, made on photographic paper) by wetting the print and scratching into it with a sharp instrument. But I’m not knowledgeable enough about RPPCs to know how it was done. I get the impression that this camera was left closed in a drawer for a long time. When I received it, most of the raised spots on the leather had turned brown. A little shoe polish solved that. I’ve read that the autographic notes were not intended to show up on the print. Anything written into that box appeared only in the space between images on the negative. I have this camera, too. Pretty sure it’s fully inoperable. Right now, my old collectible cameras are in storage. Cool! Even inoperable, it would look good on display. Absolutely gorgeous! I don’t even collect cameras and I’m smitten. Given your love for old typewriters, I’m not surprised! The best explanation I’ve seen of the Autographic system is by David Silver. That’s a very helpful writeup. Thank you for sharing it! Another great post, Jim! I never cease to be amazed at the cameras you find and the wonderful prints you get from them. Too bad you can’t give this one a shot! I’m so glad you enjoy my camera posts. I’ll give away my secret — I buy my cameras on eBay. But occasionally someone gives me one, like this. 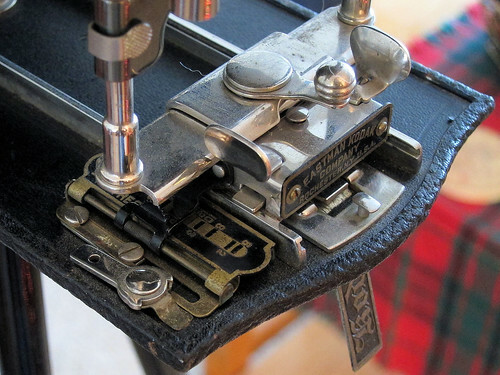 Jim, Thanks so much for a very interesting article and description of this old camera. I’m so glad you are appreciating it and that I was able to find a very good home for it. Enjoy it! Jan, it’s a beautiful camera and I’m grateful you sent it to me! 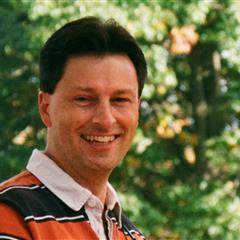 Hi Jim… really nice Kodak Autograph. Mauricio, I have to admit, I’m unlikely to fix this camera up and adapt it for use. I have too many other cameras here that I haven’t shot yet, but that take readily available film! Notice the hose “barb” on the pneumatic cylinder opposite the shutter lever? It was for remote shutter release with a bulb on a rubber tube. The cylinder nearer the shutter lever [without a barb] was a pneumatic timer piston for longish [but shorter than B or T] exposures. Heck of a camera to learn on. Hard to forget its quirks. At six frames per roll, it taught me to make every shot count. Ah, so you have experience with one of these? That’s really cool. Now I know I should have made an offer on the Kodak 3A. It’s the same camera used by the great author/photographer Jack London around 1903. I’m going back to that house in a few days to make an offer. I’m not sure I would buy one of these if I saw it, because its defunct film size makes it a display piece only. My little house is running out of places for display pieces! But I have a hard time saying no when someone offers me a camera for free. I rarely purchase cameras I cannot use. But I’m pretty fond of Jack London as a writer and photographer (his photography is wide-ranging). If I can get the nice Kodak 3A for $10, I’ll do it. These obsolete cameras can still be used with reversal paper. You can buy that at Freestyle. Cut to size and carry in a box inside a changing bag. Not inconvenient when you consider the things you don’t need to do–like processing the film and printing it. For a semi digital (alright, Polaroid) experience use a changing tent in your car or van. Don’t leave the scene without one (the finished print). You process the print in small trays fitted with a semi lid to control slop. Time adjust for temperture. Not critical. Scan for duplicates can be made with cheap non film scanners. The original is one of a kind. You will attract attention! Dude, you are guerilla! That sounds like real fun. Makes me want to fix the pinholes in the bellows of this old girl. I shoot a fair amount of X-Ray film in my 4×5 view camera and 4×5 pinhole, Fuji HR-T 30 double-sided X-Ray film and Kodak Ektascan BR/A single-sided X-Ray film specifically and that got me to thinking. By cutting down some slices of the Ektascan to postcard size, covering up the re frame window with black tape on the back to make it light tight(ish) and taping a slice of the film to the inside of the back cover while in a black changing bag I should be able to shoot this thing. In theory, it should work. I may have some light leaks I will need to detect and plug up but my 3A’s bellows are fully light tight and the shutter and apertures all are accurate. I’ll try it this weekend, develop the shots and head into the darkroom to do some test prints on the 4×5 enlarger. I’ve got nothing to lose. I love the idea of shooting with a 100 year old camera. Now that would be some serious guerilla photography! I like to shoot with 100-year-old cameras too, but not if it means adapting film. oh my I love this vintage camera.. makes me think of turn of the century ladies in those long, shapeless dresses and hats, posing for the camera :). I will be back! This is a truly beautiful camera. I have it on a vintage tripod in the corner of my office so I can always look at it. I have a 116 autographic series II camera. I also own a roll of Autographic film, unexposed for the same camera. I plan to expose the film to test the way the Autographic principle works. I have my doubts concerning success of 80 year old film, but you never know! Wow! Good luck. I hope you’ll share the results online! Is it possible to find film for this camera? When my papaw died, it was left in our possession. I remember him taking pictures of us every Sunday with this camera. The film for this camera hasn’t been made in decades, unfortunately. I’ve heard of people using 120 film in cameras like this but it is a tricky thing at best. Jim you are “an occasion of sin”. I saw this camera on your site some time ago and have been looking on Ebay for one that was a) in usable shape and b) at a reasonable price. I finally found one for $60 that even had the stylus. The only thing missing is the strap for the case. 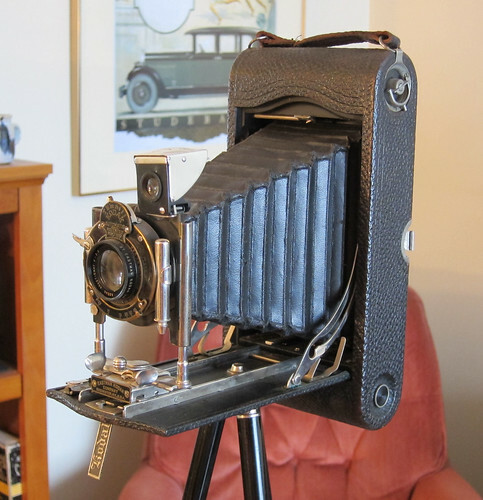 According to the manual, Kodak made a back that would take plates and/or sheet film holders. If I ever find one, I would be tempted to try this baby out. I might note that t\my camera is 20 years older than I am and is in much better shape. Sorry, brother, that I caused you to stumble! But if you ever find the plate/sheet back and shoot your No. 3A, I’d love to see the work! Awesome. I should try it someday. This is a beast of a camera but I’d love to see what its lens can do.